I’ve recently come to the conclusion that the Greeks make the best cookies in the world. If you want to call them by their Greek names, they are real tongue twisters and difficult to pronounce, but they are simply the best. 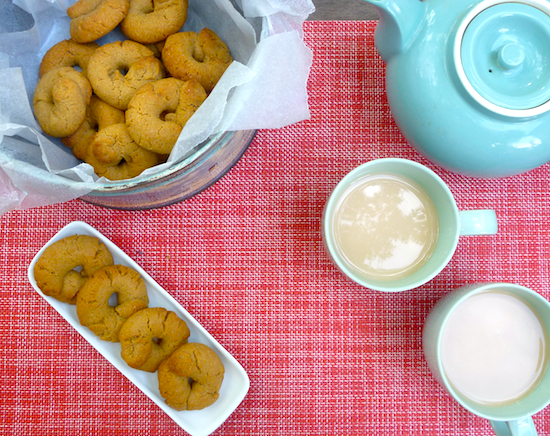 If you are a ‘dunker’ (as all our family are), they are great for dunking in either tea or coffee, this is very important because, so often, a cookie is only good for dunking in one or the other, not both. These cookies are made with grape-must syrup or petimezi, which is a grape molasses that has been used as a sweetener since ancient times. With a lot of Greek food, you can feel its roots stretching back to antiquity – it’s easy to imagine all those famous Greek philosophers and writers chowing down on something remarkably similar to this cookie. This particular cookie, moustokouloura, is also made with olive oil (not butter) and so can be eaten during Lent and is suitable for vegans. Gently spicy and aromatic, they aren’t too sweet and can keep for weeks in a tin. This longevity is a good thing, particularly if you’re like me and have a tendency to over-eat cookies when you bake them. 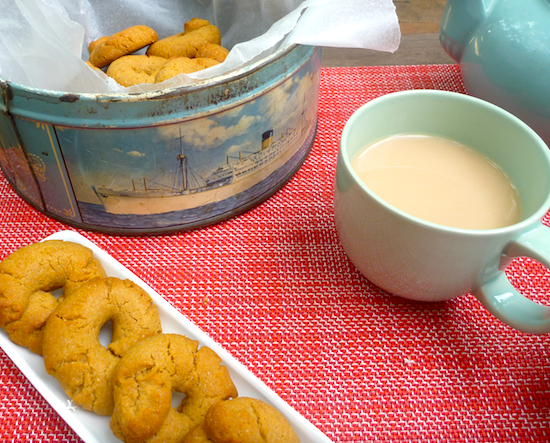 The first time I made these cookies, I ate so many of them I felt sick and I couldn’t eat them again until a couple of weeks later when I found them, all forgotten and languishing in a tin. Only then had I recovered from my overindulgence and, in fact, their flavours had matured and tasted even better after a week or two in a tin. The raw cookie dough is quite heavy and oily and it is actually quite difficult to work with. The first two times I made them, I really struggled to shape the dough into the rings. 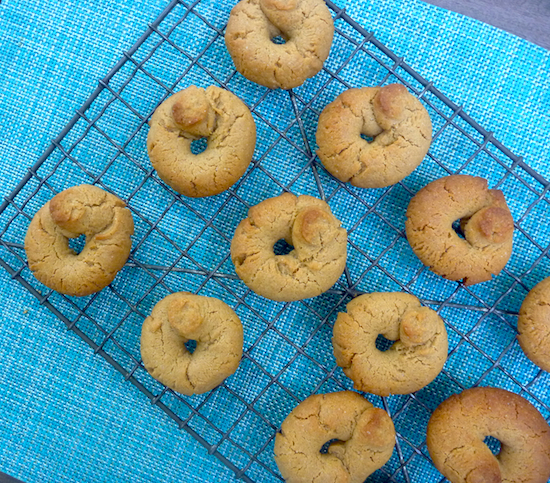 The original recipe says that you can roll the pieces into cylinders and shape the cookies, but I had no luck doing it that way and, instead, had to pipe the dough through the large nozzle of a piping bag. I added more orange juice this time, which made the piping process a bit easier because the dough was softer and not as stiff as when I made them before. I might even add a bit more orange juice next time to make the dough even softer. Even with the slightly softer dough, I found the dough cracked when shaped into circles and I still had to gently mold the dough together on the baking sheet. Once baked, the cookies will crack again but that is how they should be. They aren’t a glamorous looking cookie but very rustic looking; indeed, even ancient looking, just like something Socrates and Plato may have eaten together in 400BC. Whisk together flour and baking powder, and set aside. In a large bowl, add olive oil, sugar, cinnamon and ground cloves and beat with a stand or hand mixer on medium for about 2–3 minutes. Mix baking soda through orange juice until frothy, then add to olive oil mixture and beat through until incorporated. Then gradually add flour-baking powder mixture, beating on medium speed. Once dough starts to form, add the rest of flour, mixing with your hands until all the flour is incorporated and you have soft, silky oily dough. If you have a powerful stand mixer with a paddle, you can add all the flour to the dough in the mixer and mix until you have soft, homogenous dough. If you want to shape the cookies by hand, place the dough on a lightly-floured surface and kneed until pliable. Cut dough into small pieces and roll into 2 x 17 cm cylinders and shape into circles on baking sheets. If you find the dough too oily and difficult to work with (as I did! ), don’t bother kneading the dough, but put into a piping bag with a large nozzle and pipe directly onto the baking sheets in circles. If there are large cracks in the circles of dough, gently mold them back together. They will crack again in the oven but that’s how they are meant to be. Place one tray in oven on the middle rack. The cookies will only puff up and spread a little when baking. Bake for about 13–15 minutes until lightly browned round the edges. Check the cookies after 10 minutes – once they begin to brown, they can cook quite quickly and will overcook on the bottom. Once baked, place on a wire rack to cool completely and bake next batch. These cookies will keep for at least four weeks in a tin. * Petimezi – grape-must molasses or syrup is available from Greek and Middle-Eastern grocery stores. It is a bit of a task tracking down the grape molasses but totally worth while. Hey there. 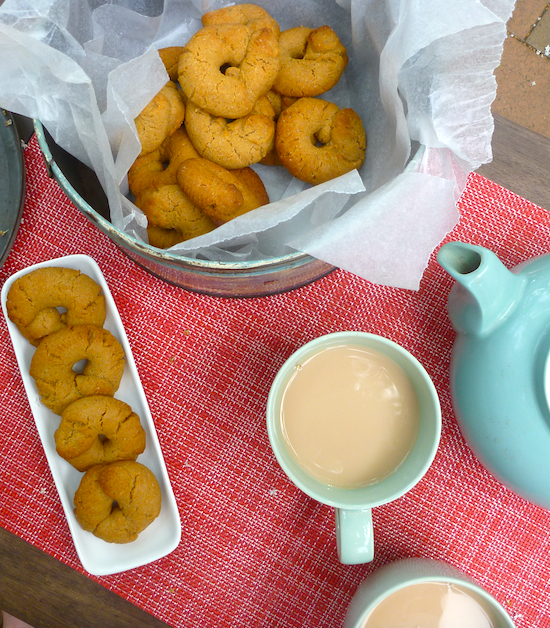 I’m glad you enjoyed my recipe for moustokouloura! I mention in the recipe that if you find it difficult to roll them by hand, to use a pipping bag, so I’m glad that helped you. They are indeed difficult to handle if you are not used to this type of oily dough. By adding more orange juice as you did, you actually make the soft type of moustokouloura, which are great as well. Love how yours look and thanks for acknowledging the recipe source. Not many people do that, so thank you. They are now a family favorite. Love your blog, your recipes are always easy to follow with so many great process photos. I don’t think my moustokouloura looked as beautiful as yours, but they made up for their ugliness in taste. The homemade ones are so good occasionally I buy some commercially made ones and they are a pale, pale shadow.